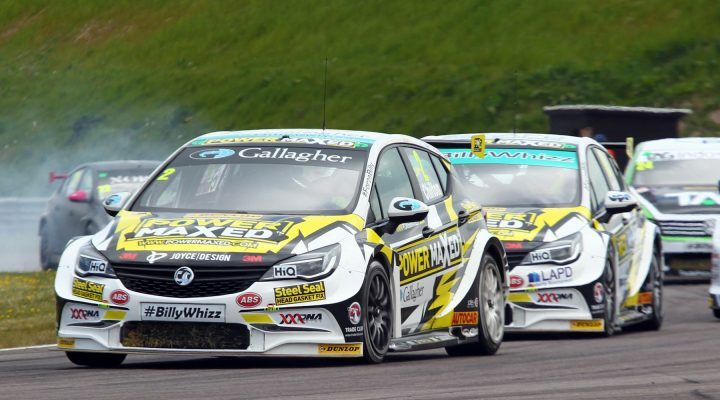 Power Maxed Racing left Thruxton with a trio of points finishes and more silverware following another positive Dunlop MSA British Touring Car Championship weekend for the new Vauxhall Astra. The outfit were optimistic following valuable testing outing in Hampshire two weeks prior and qualifying showed that the team could well be there or thereabouts. Chilton donned new tyres for a run half way through the session and promptly set a session record sector one, followed by a flying second sector – a personal best. Unfortunately at the last, the red flag emerged, forcing Chilton to back off and effectively invalidating his lap. Still, Chilton qualified in 11th with Proctor just behind in 14th. Race one saw Proctor pass Chilton as the latter lost ground through an obscured view of the five second board. Chilton now had a point to prove, passing Matt Simpson on lap nine, Aiden Moffat on lap 12 and was fighting with Andrew Jordan for 12th. An uncharacteristic spin from Jordan forced the Vauxhall man into evasive action, losing the Surrey racer two positions in the process. Proctor, meanwhile kept his head down to cross the line just outside the points in 16th – collecting another Jack Sears Trophy victory. Proctor was involved in contact with the two MGs at Church on the opening lap of race two, resulting in all three cars leaving the circuit and Dan Lloyd hitting the barrier with force, causing a red flag. The Vauxhall was forced into pitting to repair a damaged oil cooler and tyre and the PMR mechanics made the turnaround for the restart with some quick work down in the garage. After the restart, Chilton briefly found himself on the defensive but had made three forward moves by the third tour. Proctor’s focus was firmly on the JST, and race two would be a case of damage limitation. The rookie made up seven places by lap six when the race was prematurely ended by another red flag. Both Astras started race three well, with Chilton running 11th and Proctor 22nd. The former held station throughout a competitive race, making up a spot to finish top-ten, and setting the fastest race lap of the weekend, just a few thousandths-of-a-seconds shy of Yvan Muller’s 2002 lap record, also set in a Vauxhall Astra. “The team have put together a mega car, and it’s a case of could have, should have, would have,” said Chilton. “I didn’t have the best start to the weekend. First, the red flag in qualifying, then being unsighted and losing grid places for the start of race one. However, I got my head down and did what I do best – race for position. Senna Proctor said: “It’s been an exciting weekend, race one was a steady way to ease into Thruxton, winning the Jack Sears was a good result for a steady race. “The second was an action-packed affair, and I was thrown right into the action being sandwiched in between the two MG’s and honestly I think I was lucky to escape that one. Race three was more promising, and I wanted to keep it clean. Adam Weaver, Power Maxed Racing Team Principal, reflected: “The team have had their work cut out this weekend and have again risen to the occasion. It is only the third outing for our new Vauxhall Astra Touring Car, and we are still learning a lot.